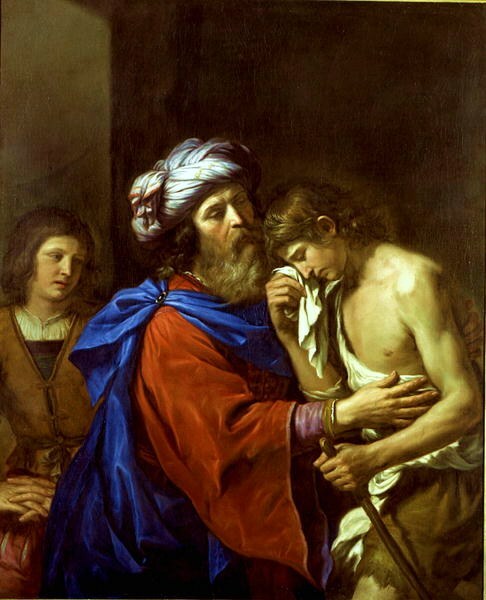 On the surface, the story of the prodigal son is one of the most comforting Gospel readings: God portrayed as a gentle and loving father, waiting with open arms to welcome us home, no matter what we’ve done or how far we have strayed. So why do I find it such a hard reading to accept? All too frequently, I identify with the oldest son, not in that I resent a lack of goat roasting parties, but in my rigid mindset toward guilt and reparation, my struggle with the concept of unbounded love and mercy. How is it logical or just to forgive and reward the repentant sinner? I speak primarily about how I analyze my own guilt. I stand as the oldest son, and I sneer at myself, the prodigal. Ask for forgiveness, and move on? How is that fair? I’ve done wrong. I know I’ve done wrong. I sometimes see life as a ledger, and I’m so far in the red, there’s no digging out. No hope. This is part of why I have trouble approaching the sacrament of reconciliation. On top of having to say I did the same stupid embarrassing things again and again and again, on some level, it feels like a sham, a trick. It can’t really be that easy, can it? I just come back, sincerely say I’m sorry, and bam, I’m not only forgiven but welcomed with abundant graces? This Gospel teaches us that yes, it is that simple. That beautiful. That…unfair. The truth is that God isn’t fair. If we all got what we deserved, we’d all get damnation. Instead, God is merciful. Infinitely so. That’s hard for me to wrap my head around. It isn’t clean and tidy, it isn’t this plus this equals that. It doesn’t make sense. And so, a lot of the time I am the prodigal son, but I get stuck at the point in the story where I’ve squandered my inheritance and am starving in a pigsty, miserable, afraid to go home. I tell myself I’m not worthy of even being where I am. I wallow in my shame, while my Father mourns. I don’t even give him the the opportunity to embrace and console me. That’s pride. That’s foolishness. Do I think I can sin so big, God doesn’t have the capacity to wash it away? It’s time–it’s always time–to dry my tears and go home. This Sunday’s Gospel was the Wedding at Cana. As you’d expect, much of Father’s homily was about marriage, and as the apparently perpetually single person I am, it was a little hard to glean what still applied to me. But as so often happens, despite myself, a few new insights poked through. Father started out by speaking a little bit about wedding practices at the time. Weddings were huge celebrations, with the party sometimes lasting days, until the food and drink ran out. Running out quickly was, frankly, embarrassing. But this couple ran out. And Mary noticed this, and quietly interceded for them. They ran out of wine: it’s the sort of thing I’d tend to think too small and too human to pray about. What does it matter in the grand scheme of the universe if a party doesn’t go perfectly? What does it matter if I’m worried about driving home in yucky weather, or finishing a not terribly important project at work, or finding a budget-friendly-yet-flattering dress for my brother’s wedding? But Jesus responds to their situation with preposterous generosity. Preposterous! Not only does he provide wine, he provides a LOT of wine. And not only does he provide a lot of wine, but it’s seriously good wine. The Wedding at Cana is often interpreted to be a foreshadowing of the Eucharist, or Jesus’ way of establishing marriage as a sacrament, and showering blessing on both the specific couple and, symbolically, all couples and all marriages. And all those interpretations are valid. But it was also something very simple—an overwhelmingly generous response to a very human and earthly problem: they have no more wine. It gives me hope that it’s OK to ask for help when I’m feeling frustrated by ordinary problems in ordinary life. I find that very comforting.